Yes, Belgium represents many of the world’s finest beers! Yes, beside the French frites, Belgian waffles and chocolate, we produce the best beers! I hope you know that! And that’s why you came to Belgium, right? Perfect, no shame in that, welcome! 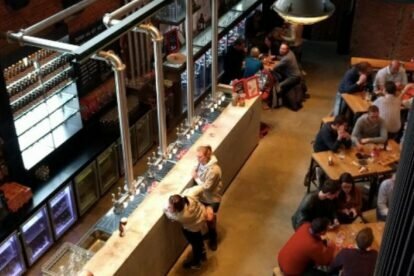 Belgian breweries are not just some dusty old frames anymore where beer is produced. No, thanks to brand awareness and presence, the producers have renovated their production stores and turned them into an experience for the visitors. So, enjoy your journey at our city brewery ‘De Koninck’. I’ve already been twice – of course! The entertainment, tasting, location… No words. Just visit our Antwerp Brewery. Brewery ‘De Koninck’ is located in the south city center, close to King Albert Parc. A ‘Koninckske’ is a normal beer (5.20%). Their sister ‘Wild Jo’ is 5.80%. Nice to know: a draft ‘De Koninck’ beer, is tapped in 3 goes! Especially during this spring time, you will be able to taste the yearly new ‘spring-beer’, created by this brewery. FYI: Do you know thé Belgian beer Duvel? It is from the same brewery as De Koninck!